A volume of 500ml equates to 4,000 cm2 of membrane. 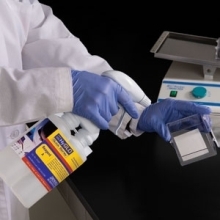 HyGLO� Quick Spray provides instant synchronized mixing of two reagents for detection sensitivity to one picogram of antigen. The chemiluminescent signal can be detected on autoradiography film, such as HyBlot CL�.